Power Consumption: Who is the king? Intel promised us better performance per watt, lower energy consumed per instruction, and an overall serious reduction in power consumption with Conroe and its Core 2 line of processors. Compared to its NetBurst predecessors, the Core 2 lineup consumes significantly lower power - but what about compared to AMD? This is one area that AMD is not standing still in, and just days before Intel's launch AMD managed to get us a couple of its long awaited Energy Efficient Athlon 64 X2 processors that are manufactured to target much lower TDPs than its other X2 processors. AMD sent us its Athlon 64 X2 4600+ Energy Efficient processor which carries a 65W TDP compared to 89W for the regular 4600+. The more interesting CPU is its Athlon 64 X2 3800+ Energy Efficient Small Form Factor CPU, which features an extremely low 35W rating. We've also included the 89W Athlon 64 X2s in this comparison, as well as the 125W Athlon 64 FX-62. Cool 'n Quiet and EIST were enabled for AMD and Intel platforms respectively; power consumption was measured at the wall outlet. We used an ASUS M2NPV-VM for our AM2 platform and ASUS' P5W DH Deluxe for our Core 2 platform, but remember that power consumption will be higher with a SLI chipset on either platform. We used a single GeForce 7900 GTX, but since our power consumption tests were all done at the Windows desktop 3D performance/power consumption never came into play. We took two power measurements: peak at idle and peak under load while performing our Windows Media Encoder 9 test. Taking into consideration the fact that we were unable to compare two more similar chipsets (we will take a look back at that once retail Intel nForce 5 products hit the shelves), these power numbers heavily favor Intel. The releative power savings over the Extreme Edition 965 show just how big the jump is, and the ~15% idle power advantage our lower power AMD motherboard has over the Intel solution isn't a huge issue, especially when considering the performance advantage for the realtively small power investment. 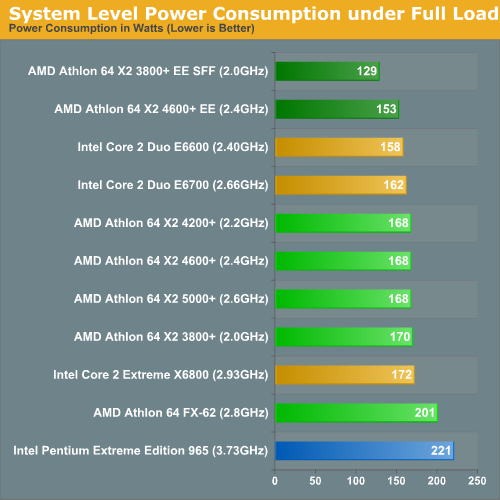 When looking at load power, we can very clearly see that AMD is no longer the performance per watt king. While the Energy Efficient (EE) line of X2 processors is clearly very good at dropping load power (especially in the case of the 3800+), not even these chips can compete with the efficiency of the Core 2 line while encoding with WME9. 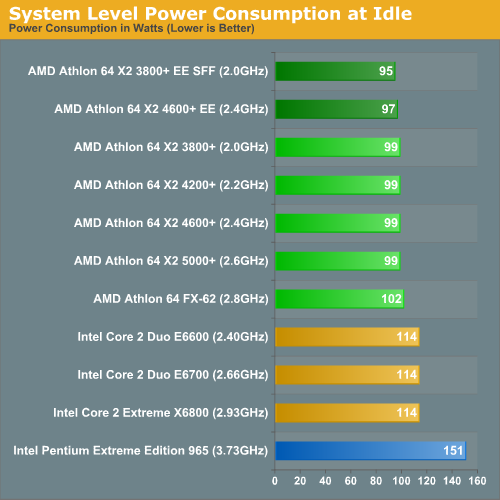 The bottom line is that Intel just gets it done faster while pulling fewer watts (e.g. Performance/Watt on the X6800 is 0.3575 vs. 0.2757 on the X2 3800+ EE SFF). In fact, in a complete turn around from what we've seen in the past, the highest end Core 2 processor is actually the most efficient (performance per Watt) processor in the lineup for WME9. This time, those who take the plunge on a high priced processor will not be stuck with brute force and a huge electric bill.